Is There Any Hope In Getting Recognized? It can be hard visiting an organization and then hearing how unrecognized their employees are feeling. Those responsible for employee recognition can often point to the latest employee engagement survey to prove the point. The lowest scores I have seen hover around the same magic number of only 33 percent of employees feeling valued and recognized for their contributions in the workplace. Which naturally means two thirds of the company’s employees don’t feel recognized or appreciated. That’s a lot of people. 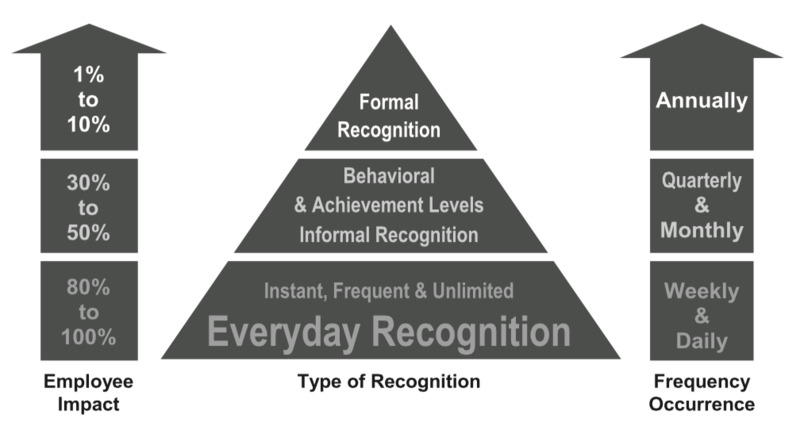 Most of these organizations focus too much of their time on formal award programs and ceremonies and neglect the more important everyday recognition.Taking a look at the basic structure of recognition in organizations, recognition forms a hierarchical pyramid, with the foundation being everyday recognition, informal recognition in the middle, and the apex being formal recognition. I will quickly clarify each of these three levels of recognition. Formal Recognition: Formal recognition is usually companywide in nature, more of a structured program impacting 1 to 10 percent of the employee base (typically in the low, single digit percentage levels), occurs annually, are categorized mostly as earned, nominated or workplace milestone based, maybe based on adjudicated nominations, ending up with an award, gift or bonus, and often with a companywide, ceremonial, formal event with senior leaders present, and has a high budget spend. Informal Recognition: Informal recognition tends to be mostly departmental or divisional and impacts a range of 30 to 50 percent of employees, can be structured programs with incentives or awards, as well as social celebrations, occur monthly to quarterly in frequency, can be earned, nominated or social milestone/ events, culminating in local social celebrations and may include awards, plaques and other forms of recognition, and has a medium level of budget costs. Everyday Recognition: Everyday recognition is mostly one-to-one between a manager and employee or peer-to-peer, can impact around 80 to 100 percent of employees, occurs daily or weekly, and is spontaneous acknowledgement for demonstrating exemplary behaviors, living of values, and achievements, culminating in social reinforcement and acknowledgement and no-cost or low-cost gift, award or token of appreciation, and are mostly personal practices along with online programs. When measures of recognition activity are low, or recognition scores poorly on engagement surveys, and employees are frustrated with not receiving any recognition, you can almost guarantee that leaders and managers have lost sight of the power of everyday recognition. Recognition practices are the frequent (often daily or weekly) personal and habitual behaviors people do to express appreciation to others as well as the cultural and customary ways an organization has of showing people that they and their contributions are valued. Recognition programs are the regular (typically monthly, quarterly or annually) formal or informal organizational procedures and online administered programs for providing scheduled individual or team acknowledgment, awards, incentives or rewards, for achieving various strategic, behavioral or performance based criteria. Systems and programs should not drive recognition giving. Too much money, time and resources are put into formal recognition programs. With only 1 to 2 percent of employees benefiting from formal awards, no wonder a whole bunch of employees are clamouring to be recognized. To give employees the hope of ever being valued and appreciated for their contributions, we need to set the expectation for giving recognition the right way, to everyone, wherever they work. We should focus more on recognition practices than just recognition programs. We live our values of respect and caring for one another. It is remembering our manners and the everyday courtesies. 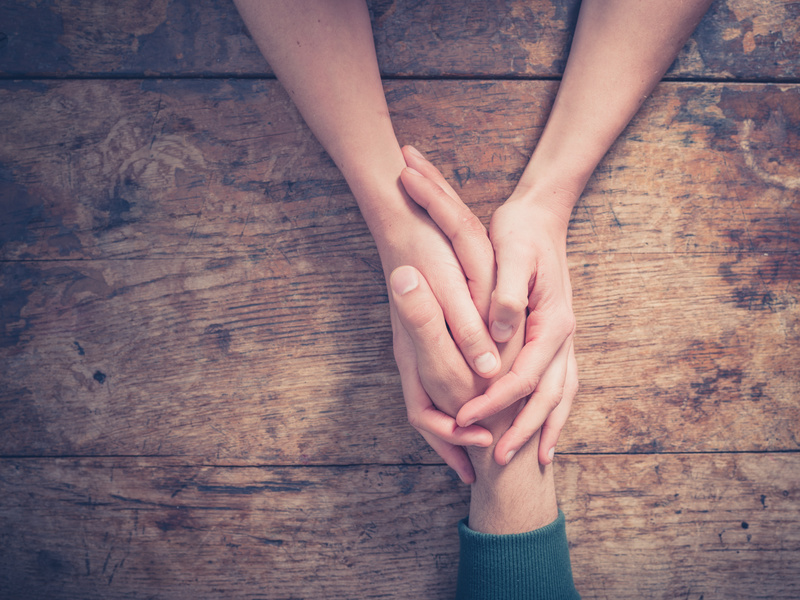 It’s about reaching out with care and concern around people’s need to be celebrated and comforted around their specific personal life events. And it is about observing and expressing appreciation and gratitude for people for who they are as well as what they do each day. It is starting one person at a time by saying “Thank you!” whenever appropriate and demonstrating that each employee matters. Q: How have you elevated the hope of employees to be appreciated for who they are and recognized for what they do?